We offer at public auction the unique home of Walter J. Johnson, well-known collector of fine antiques. Nestled between Hyde Park and Mt. Lookout Squares, this three-bedroom brick-and-siding house sits on a finely landscaped lot with large shade trees. 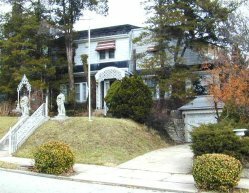 The stately lions flanking the front walk are local landmarks, and the arboretum has received significant mention in the local press. Enter into the large foyer with half-bath and coat closet. To the left of the foyer is a large formal dining room, followed by the kitchen. To the right of the foyer is the living room, with Rookwood fireplace and double glass doors leading into the arboretum. Completing the downstairs is a sun porch trimmed in knotty pine and brick. Picture windows in the sun-porch overlook the arboretum and the front yard. The upstairs hallway with large closet connects the three bedrooms. The nice-sized master bedroom has a closet and ceiling fan. Another bedroom has an attached greenhouse extension with planting areas. The tiled bathroom also has a large storage closet. From the living room, green slate stairs with curved wrought iron rails lead into the 42x42 foot arboretum, which is of conservatory quality. A waterfall runs over a ten-foot high jagged stone wall into a long pool below. Brick and stone walkways wind through tropical plants of all kinds. Fountains, pools and statuary add further elegance to this glass-roofed jungle. The large, raised, tri-color slate patio is the perfect place to sit back and enjoy the surroundings, dine, and entertain. A separate hot-water heating system keeps this area warm and moist for year-round healthy plants and happy visitors. The basement features a half bath and includes a workroom with large workbench. The one-car garage is accessed through the basement. The home has many fine lighting fixtures and gas forced-air furnace with electronic air cleaner. features and sought-after neighborhood make it a potential dream home. Read the Terms & Conditions of the auction.